I think we are addicted to Greek and Middle Eastern foods here in this little corner of the world. It seems that my husband and I seek out local Greek restaurants on every opportunity! Why? We are not drawn in from some ancestral attraction, yet there is obviously something in the flavors, the spices, and the atmosphere that attracts us every time! 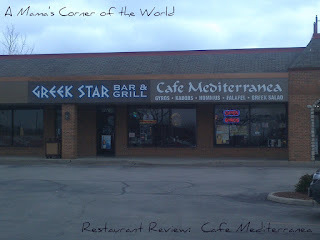 Our most recent lunch outing found us at the Café Mediterranea Greek Star Bar & Grill in Pickerington, Ohio. What was our restaurant review of Café Mediterranea near Columbus? 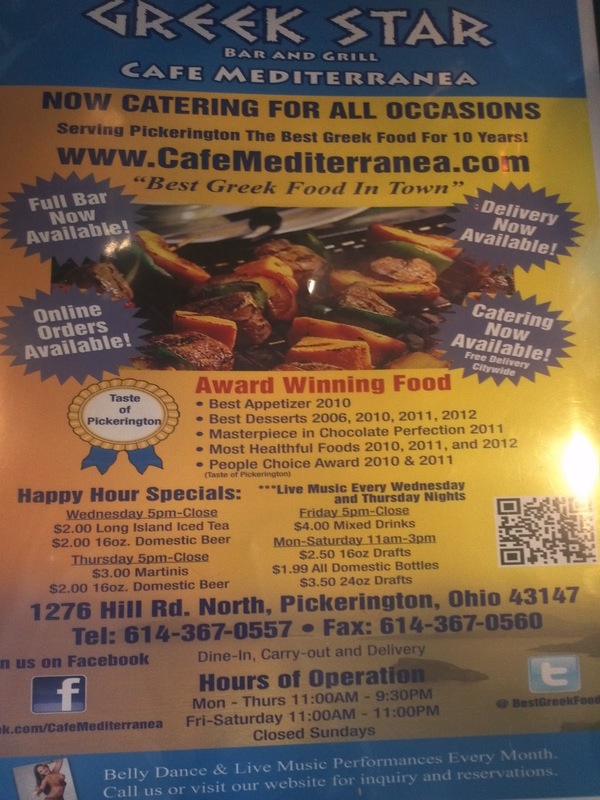 How was the dining atmosphere of Café Mediterranea in Pickerington Ohio? The Café Mediterranea is located in a strip mall along the main route between the East Columbus suburbs of Reynoldsburg and Pickerington. The restaurant shares dining space with the Greek Star Bar and Grill. The café was fairly busy during our lunchtime visit. We were directed to seat ourselves. The furnishings and plain tabletops were a little worn, a faint mural adorned the wall near the bar, and muted televisions were tuned to sporting events while themed music played. How was the service at Café Medierranea? After seating ourselves, we initially sat unnoticed by a server. We opted for an appetizer—and when it arrived; the server whisked our menus away without taking our lunch orders. When we requested an entree order a while later—she apologized by discussing a recent cold/flu bug that has affected her “focus”. (Perhaps something best not discussed while serving my food?) Aside from those few awkward moments, service was friendly, very quick and fairly attentive. 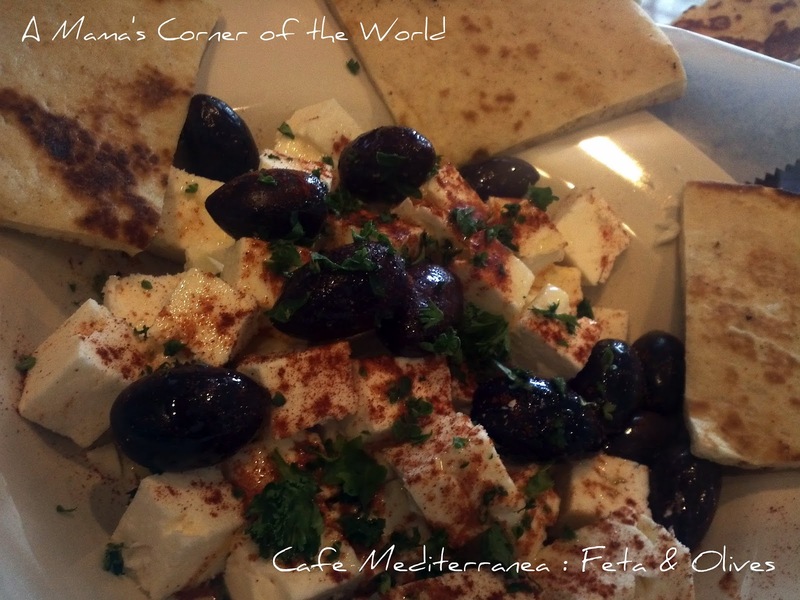 How was the food at Café Mediterranea? After all, the food is the reason for the visit, right? For our appetizer, we chose the Feta Cheese with Olives. We received a plate loaded with cubes of marinated feta cheese and Kalamata olives along with warm pita bread triangles. The server immediately warned us that the olives were not pitted. The appetizer was flavorful—just a bit awkward to eat without appetizer plates and with olive pits! I opted for a regular Gyro—while my husband chose the Signature Spicy Gyro. Expecting large portions, we skipped the Greek fries although they looked great as they passed our table to others! 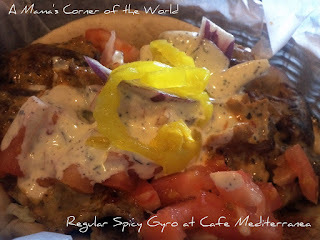 Both gryos were delicious—the house sauces for both the regular and the spicy gyro were perfect complements to the tender, spiced meat and fresh vegetable fillings. 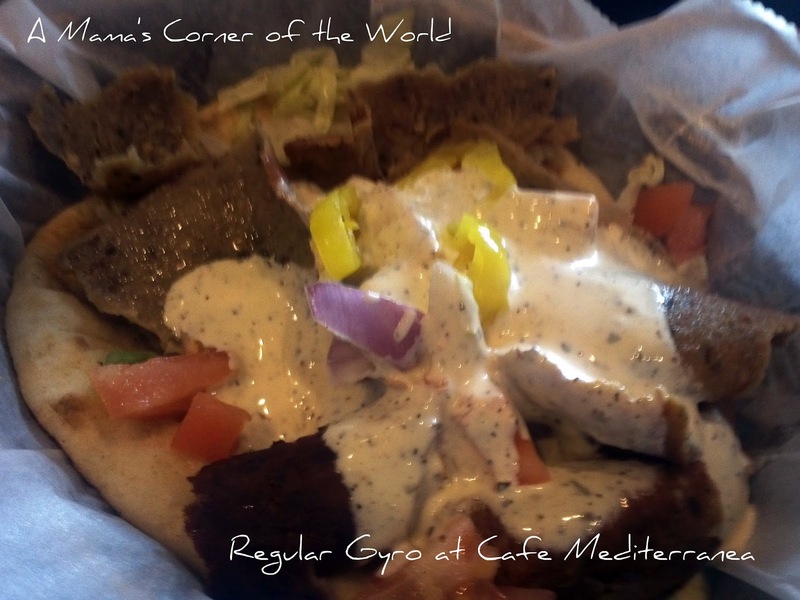 We were also correct in expecting that a regular sized gyro would be more than enough for lunch! 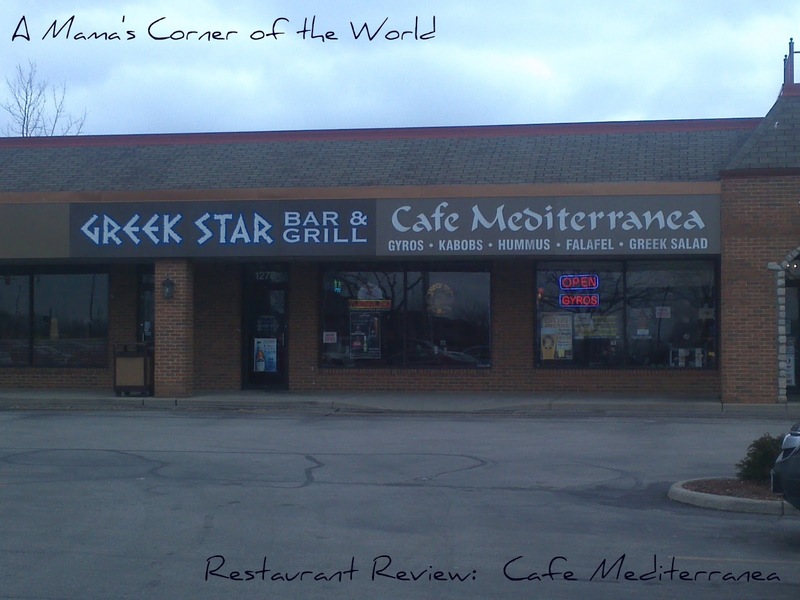 Our final thoughts on Café Mediterranea Greek Star Bar in Pickerington Ohio? The food will draw me back. I may choose takeout in the future because I was not extremely drawn to the atmosphere. The food; however, certainly earns repeat business. 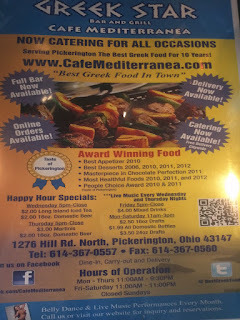 I would recommend Café Mediterranea for those seeking great Greek food in a casual bar and grill/diner type atmosphere. I think it's a great work-lunch diner to venture away from the usual lunch spots. If the diner/bar and grill layout is not your cup of tea—you still need to try the food. They even deliver within a local delivery area and coupons are frequently available in local coupon books and mailings. Disclosure: We were not paid in any way for this review--we just thought we'd share our latest restaurant find with our readers. I was excited to discover this web site. I need to to thank you for your time due to this fantastic read!! I definitely enjoyed every bit of it and i also have you saved to fav to check out new stuff on your blog.